Bags and Dark circles can darken your eye contour. 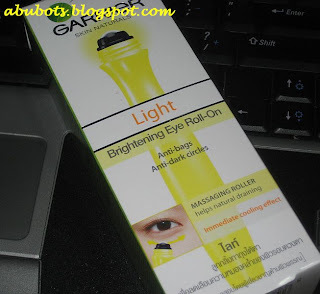 Garnier Light eye roll-on is a massaging roll-on that combines caffeine and the draining effect of a massage to reduce bags and dark cicles and brighten the eye contour. Massage is a technique used by experts to boost natural draining and decongest tired eyes. The formula, enriched with caffeine, known for its stimulating properties on micro-circulation, helps to brighten the skin and boost radiance. also, it depuffs eyebags. one morning, i woke up with horrible swelling eyebags (for crying the night before) and i reached out for this and it really helped. the packaging. fits in my makeup kit..
for those with dry undereye areas or those with wrinkles already (ehem), the moisture in this product isn't enough. OCs will hate the roller "innovation" because of hygienic reasons. probably yes. 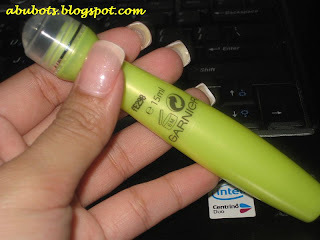 i love the cooling sensation and the instant brightening effect, but i would still use another eyecream for moisturizing. 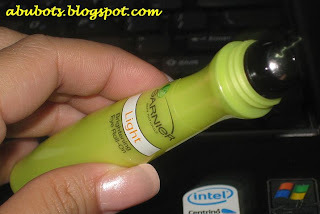 If this stuff deflated your puffy eyes, I am going out and getting some!! It's gotta be cheaper than that Talkia Eye Detox gel (which I love, but go through like water!). Thanks for the review sis... got more reasons not to try it :) My undereye area gets really really dry and I don't think this would suit me. I miss you sis... been a very long time since the last time we chatted. Muah! Been seeing the commercial for this! I love this product. I see no immediate results yet, but I love the cooling effect after application. 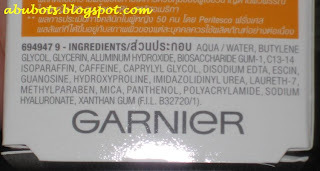 Garnier products are hit and miss for me, I hope this one is a hit.